The Portland Winterhawks will open the Western Hockey League playoffs with a best-of-seven series against the Prince George Cougars. A 7-2 loss to the Spokane Chiefs on Sunday dropped Portland into a wild-card playoff spot and means a 15-hour bus ride to Prince George this week for games on Friday and Saturday. Games 3 and 4 in Portland will likely be on Tuesday, March 28 and Wednesday, March 29 at Memorial Coliseum. The schedule for the rest of the series was not announced on Sunday. A Spokane team playing its final game of the season hustled to a 4-1 first-period lead in front of 9,114 fans at Memorial Coliseum. Six different Chiefs scored goals. Keanu Yamamoto had two goals and one assist, and Kailer Yamamoto had three assists to lead Spokane. Portland's goals were scored by Henri Jokiharju and Keegan Iverson, both on power plays. The Winterhawks finished the regular season 40-28-1-3. Despite the loss, Portland appeared positioned for a third-place finish in the U.S. Division until the Tri-City Americans rallied from a two-goal deficit to beat Everett in overtime and finish one point ahead of the Winterhawks. Tri-City will face Seattle in the first playoff round. 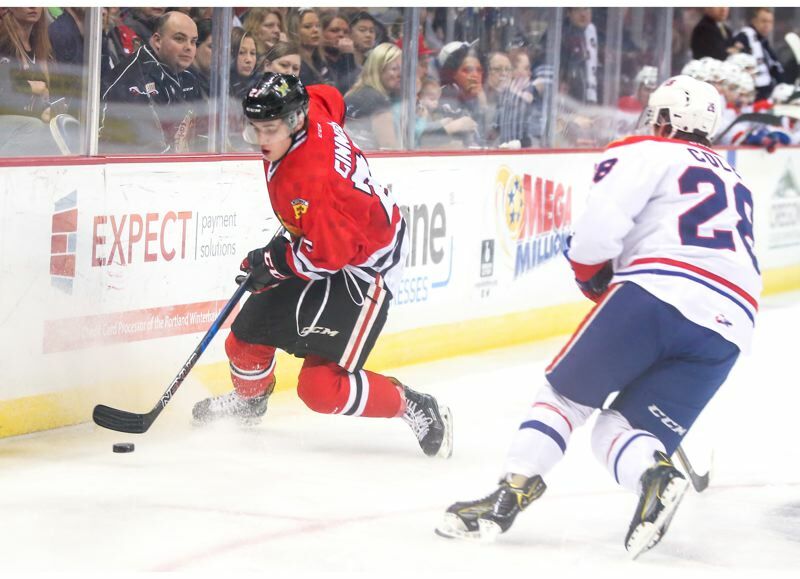 The first period was rough for the Winterhawks as Spokane got goals from four players to lead 4-1. Spokane's second goal came from Riley Woods at the end of a power play that resulted from a lineup violation. Portland listed Brett Clayton as a scratch, so when he played in the game he was disqualified and the Hawks assessed a two-minute minor penalty. Second-period goals from Keanu Yamamoto and Hudson Elynuik, both on the power play, pushed Spokane's lead to 6-1. The Chiefs were 3 for 5 on power plays through two periods, making the Winterhawks pay for a lack of discipline. Portland's first-period goal was scored by Jokiharju. He scored a power-play goal from the high slot 11:43 into the period to pull the Hawks within 2-1. Iverson scored his 26th goal of the season with one second left on a five-on-three Portland power play early in the third period to make it 6-2. Aside from who would be Portland's first-round playoff opponent, the big question on Sunday was the status of leading scorer Cody Glass. Glass did not play the final two periods on Saturday at Seattle and was a scratch on Sunday. Winterhawks VP/GM/coach Mike Johnston had no comment about the status of Glass or Evan Weinger. Hockey teams usually do not discuss injuries during the playoffs. Johnston said he would prefer a 2-3-2 format for the series with the Cougars to avoid extra trips to and from Prince George. Prior to Sunday's game, the Winterhawks announced their team awards. Chosen team co-MVPs by their teammates were Caleb Jones and Glass. Chosen by the coaches for the Winterhawk Award for character and leadership was Keegan Iverson. The Sportsmanship and Ability Award went to Colton Veloso, the Rookie of the Year Award to Jokiharju, the Best Defensive Player Award to Jones, the Scholastic Player of the Year to Ryan Hughes, the Winterhawks Booster Club Fan Favorite to Skyler McKenzie and the leading scorer award to Glass.